The teaching staff at Mayflower Montessori truly understands the development of children and realize the importance of using each opportunity as a teachable moment. Our teachers and assistants are carefully selected, specifically trained and directed by the school owners/founders to provide our students with a higher quality of education. With many years of teaching at our schools, our teachers act as facilitators rather than instructors. Teachers serve as a link between the child and the learning environment, often showing the child how to use new materials and then letting the child learn and explore at their own pace. 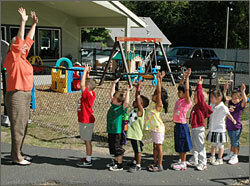 All of our teaching assistants are trained by the owners/founders and their classroom teachers. All staff members are certified in First Aid and CPR and participate in various continuing education programs in the fields of early childhood education and the Montessori Method. We also hold monthly drills (fire, earthquake, stranger on site, etc.) to ensure the safety of all students and staff.